Medu vada is a delicious South Indian tiffin item. 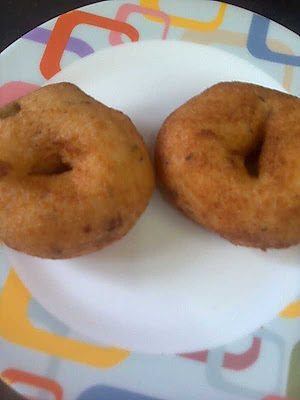 I love most South Indian food and medu vada is no exception. It takes a little time and practice to make perfect medu vada but you won’t regret it, I’m sure. 1. Wash and soak urad dal for atleast 6 hours or overnight. Drain. 2. Coarsely grind the urad dal in a blender adding as little water as possible otherwise vadas will not hold shape. Grinded dal should not be too smooth but a little coarse. 3. Add salt, green chillies, ginger and black pepper to the dal. Beat well so that air is incorporated in the batter and vada turn out fluffy. 4. Heat oil in a kadhai/ wok or a frying pan. When the oil is hot, turn the heat to medium. 5. Wet your palms and take a small portion from the batter. Shape it into a ball and then poke your thumb in the center so that a hole is formed. The idea of the hole is to increase the surface area where oil reaches so that vada is evenly cooked from all places. 6. Gently invert the vada in the oil. Similarly make other medu wada and place them in oil. Remember not to overcrowd the kadhai. 7. When the medu vada is cooked from underneath, turn them over with a slotted spoon (pauni/ chhari). Vadas should be golden brown from both sides. They should be fried on medium heat otherwise they will be golden from outside and doughy from inside. 8. Drain on an absorbent paper and serve medu vada hot with sambhar and chutney. Hey Kshipra! medu wadas look perfect.. i want some ..